We Make Recruitment Right, The First Time, All the Time! 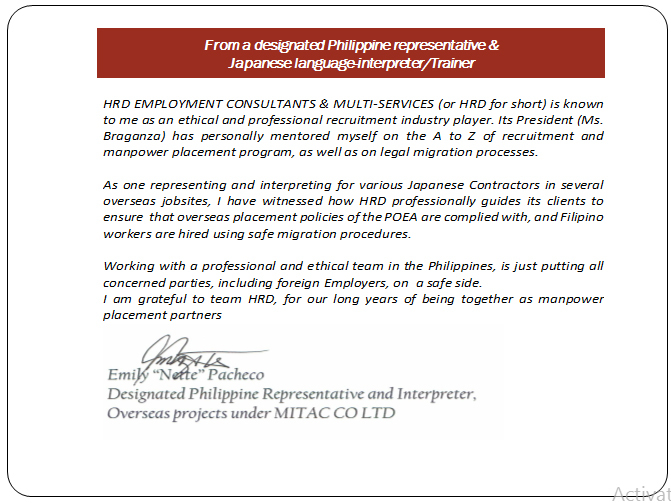 HRD Employment Consultants & Multi-services, Inc. (HRD for brevity), is licensed to recruit and deploy Filipino contract workers to various work stations overseas, for gainful employment. HRD has been in the manpower placement industry since year 2000 and our clientele includes satisfied contracting firms (Employers) in the Middle East, Guam, some parts of Africa and Asia, for various construction-engineering-projects (vertical/horizontal, power plant, refinery, Oil & Gas); healthcare firms in USA; hospitality industries and private institutions in the Middle East and Asia. Our organization (HRD)’s business credo of "Making Recruitment Right, The First Time, All the Time", assures every client-Employer, partner, affiliate, associate and employee or worker/job-applicant, of our professional and ethical services. 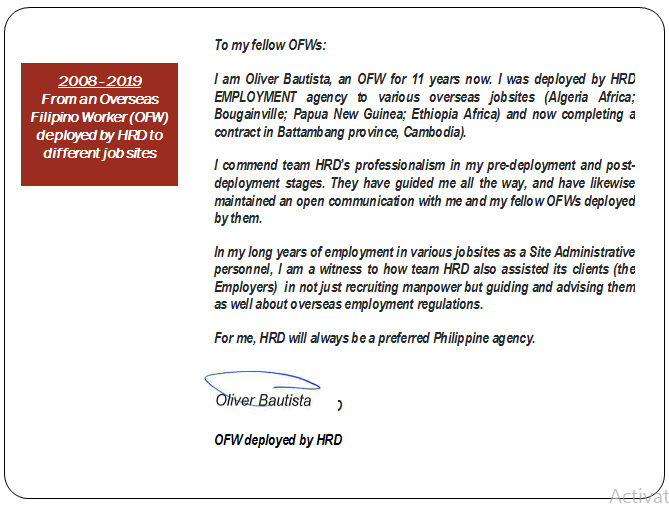 HRD’s role does not end when an applicant is selected, mobilized and deployed to the overseas worksite. HRD stays as a placement and employment partner, even after the worker is in the worksite, with our post-deployment services of helping address or resolve work-related matters involving the worker that we have deployed. 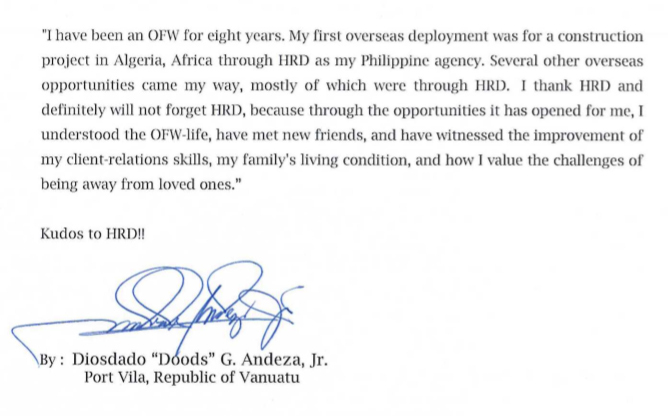 Thus, the deployed worker is likewise assured that he/she is taken cared of, until the expiration of his/her employment contract or until he/she has returned safely to his/her country of origin. 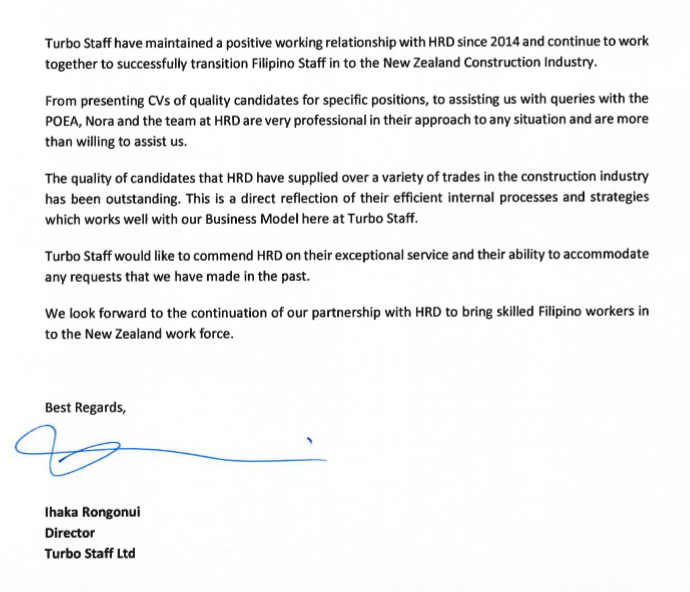 Your choosing to partner with HRD will give you the opportunities of experiencing quality recruitment service, efficient documentation management and manpower placement ---> this is our commitment. We are an agency that treats every recipient of our service as our client-customers. While foreign Principals (Employers) and job seekers are our external client-customers, our local partners and our own team members are our internal client-customers. Thus, we see to it that the services we provide are mutually-beneficial to all, but putting our external client-customers on top priority : you are our priority. Contact us, and experience what we have committed to provide. 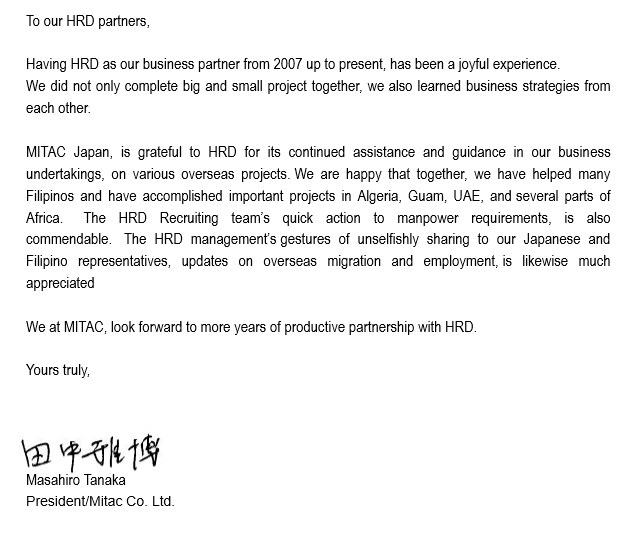 On behalf of the HRD Board of Directors, thank you very much! HRD is a dedicated organization whose mission is to help provide gainful employment opportunities to those who wish to improve their lives and those of their families. We have faith in the Filipino workers, as they are among the world's potential, easily-trained and most adoptable workers. We believe that success in business is doing the right thing. Thus, we make recruitment right, not just the first time, but all the time. We select the best available applicants. We recognize their rights and needs. We treat them right and give them the right services. We choose and train our own employees carefully. We empower them, to ensure they do their tasks right, the first time, all the time.